Since 2015, the STO has made all the raw information for the planned schedules in its system available to independent developers in the form of GTFS (General Transit Feed Specification) files. These data make it possible to geolocate bus stops, identify bus routes and make the complete planned schedules for each bus line available. Developers can download the data and use their unlimited imagination to design information tools for users, such as new mobile apps or Web sites. Like every public organization that shares its data, specific terms and conditions govern their use. Visit the Developer Space. Below is a non-comprehensive list of stand-alone apps and Web sites containing data provided by the STO. The STO is not responsible for the accuracy of the information generated by the apps or Web sites produced by developers that incorporate the STO's open data. Thanks to a partnership between the STO and Transit, our clientele now has access to a real-time app. This already very successful app is a great new tool that will definitely make your bus trips much easier. 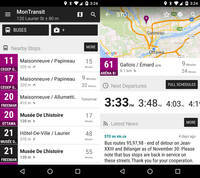 This app, which is growing in popularity, continues to prove its worth among many riders and transit corporations in Quebec and abroad. Information on the STO bus system is intergrated to this stand-alone app. Download it for free on Google Play and iTunes. Google Maps already allowed you to plan an itinerary for driving, cycling or walking. Now it is possible to get a bus itinerary for Gatineau! Just select the Transit icon, which looks like a train. From point A to point B, Google Maps tells you which bus route(s) to take based on the date and time. It also tells you how long the trip will take, how frequently the routes run and how to get to the bus stop on foot. Google Maps can also combine STO and OC Transpo services to suggest the best itinerary. Tips and tricks: We recommend that you read the “Details” under the proposed itineraries so that you are familiar with each section and transfer (if applicable) for the routes suggested by Google Maps. Comments about the application: Google is a developer just like the other independent developers. If you would like to submit a comment or suggestion, use the “Send feedback” option on the menu in the upper left corner (in the search area) when you search for your itinerary in Google Maps. 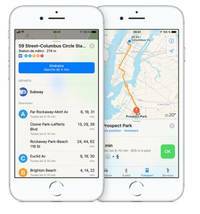 Offering a host of innovative features, Apple's Maps app now offers a Transit feature that brings you public transit information for subways, buses, trains and ferries for each city where it is available. Plan a route, pull up schedules, get step-by-step directions or ask Siri to guide you. You can even favourite a specific transit route to get up-to-date information and reminders. The list of places supported with Transit is growing, and Gatineau is now among them! Your iOS device comes with the Maps app already installed. Download the app to your mobile device from App Store. the latests news from @STOGatineau on Twitter (available as of January 2016). MonTransit is compatible with (almost) all transit agencies in Canada. STO Bus Tracker allows transit riders to easily locate bus stops close to you and view planned schedules at those stops. No Internet connection or data plan is required. The app is fully functional in offline mode. Easily access the STO's Infobus real-time arrival information using phone call or SMS. The app can be purchased on Google Play.